Listening Time: 3 hrs. 27 min. Riley works in a bakeshop and the most magical thing in his world is lemon cake...that is until the night he 's saved from zombie like creatures that spew black ooze by tiger-shifting Soldati warriors...one of whom might just be the Soldati king and Riley's mate...oh hell no!!! Neither of them are overly pleased with that little tidbit. Once Khalon and his warriors realize that Riley is his mate they have no choice but to take him back with them...at least until they can find a way to make him safe from the demons and then they can wipe his memory and return him to his world where he belongs. As Khalon and Riley travel to see the priestess and get their bond dissolved so that Riley can return home. They begin to spend time with each other, find out more about each other and inevitably neither of them can deny the pull of attraction that they are feeling for each other. I loved listening to this one on audio and I have to admit as an audio story it worked really well for me. This was so much like having someone read me a story...hey, what can I say I came from a large family and bedtime stories were a very rare event so now here I am all grown up and once in a while it's nice to have someone tell me a story and this one...well this one was definitely an adult fairy tale and I loved it. All that was missing to make this perfect was a...ok, I'm not going to say it...dragon!!! Come on you thought I wouldn't say it? But seriously tiger-shifters! They count for a lot...oh and foxlings...cute little foxlings so no dragons, but lots of other awesomeness. I really enjoyed this story but I think for me it would have been so much better if there'd been a bit more development in the romance department and maybe a bit more after things were resolved to show us more of Khalon and Riley together as a couple, but this is a series so hopefully that'll come with time, right? Manuel Pombo was the narrator for this story and I really enjoyed listening to his narration of this story. Not only did he check off my basic 'things I like to hear in an audio book' list but he gave it that bit of extra that for me is the difference between a solid or good audio experience and a truly enjoyable audio experience. For me this story was probably 3 maybe 3.5 stars while the audio took it to a solid 3.5 maybe even 4 stars for me. I'm definitely looking forward to seeing what comes next in the world of 'The Soldati' and hopefully Mr. Pombo will be on board to tell me another story. 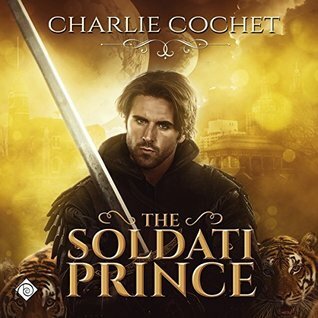 An audio book of 'The Soldati Prince' was graciously provided by the publisher in exchange for an honest review.